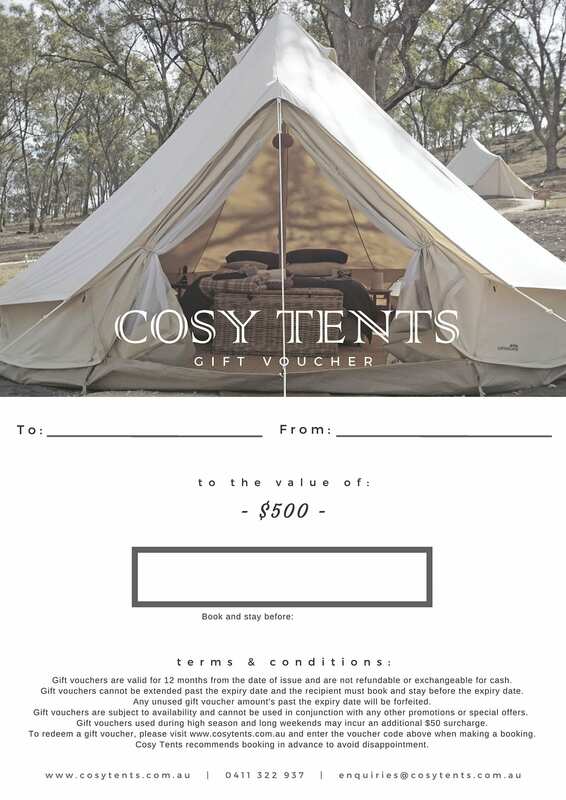 This gift voucher is for the value of $500. Note: Gift vouchers are valid for 12 months and are not refundable or exchangeable for cash. Gift vouchers cannot be extended past the expiry date and the recipient must book and stay before the gift voucher expires. Once the purchase is complete we will email you a PDF copy of your gift voucher. Please check your email junk box. A glamping getaway in the Spa Capital of Australia. Located 1.5 hours from Melbourne and 15 minutes from Daylesford. Cosy Tents is a unique luxury glamping experience that combines the essence of a hotel with the great outdoors. Enjoy a relaxing retreat in your own full furnished canvas bell tent, sit out by the open campfire, sleep under the stars, enjoy the fresh air and come glamping with Cosy Tents, Daylesford.